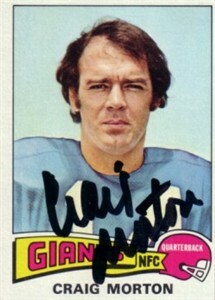 1975 Topps card autographed in thick black marker by former Cowboys, Giants and Broncos star quarterback Craig Morton. Card is in about Ex/ExMt condition due mainly to centering. With certificate of authenticity from AutographsForSale.com. ONLY ONE OF THIS CARD AVAILABLE FOR SALE.